Want to find a hot neighbor? WTF? If you want to find a hot neighbor, maybe try Craigslist, but you are definitely not going to do it by reading this blog. The actual story discusses how to find the next hot neighborhood. If you want to do that, follow the artists! This is not a huge revelation. It's been happening throughout the country and in Boston. 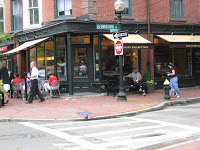 It is most recognized in the South End which over the past 10 years has seen a dramatic transformation. This transition includes trendy new boutiques, art galleries, coffee and pastry shops, and hip restaurants. Unfortunately this trend displaces many artists in the vibrant neighborhoods they essentially helped create. The article states that the next area to flourish in Boston is Jamaica Plain. Below is the clip written about JP. The neighborhood, three miles southwest of downtown, has plenty of green space. Its picturesque Jamaica Pond is popular for sailing, rowing, and outdoor concerts. It has retained its diversity and relative affordability despite the development of condos and the influx of wealthier residents. Some artists, fleeing the neighborhood's rising rents, are pushing into neighboring Roxbury. Lowell, about 40 minutes away, and nearby Somerville are also attracting bohemian residents.